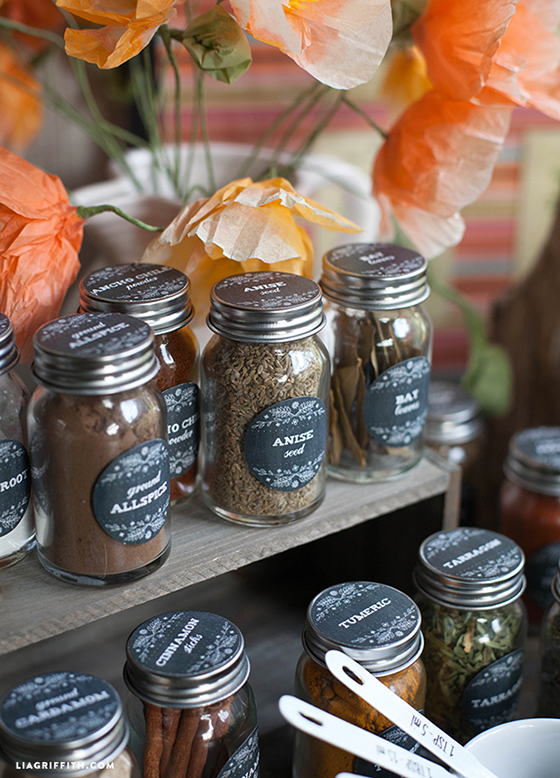 Now that you have your pantry newly styled with your Farmhouse Pantry Labels it is time to update your herb and spice labels too. Just for you, here are two sets (chalkboard and kraft paper) of herb and spice jar labels to match the pantry labels from last weeks post. For my jars, I decided to use the label on both the side and the lids of the jars to make them easy to read at any angle. If you are looking for some great reusable jars, I found mine at World Market for 99¢ each. I love to buy my refills at my local health food store’s bulk section and save both dollars and tossing my used glass jars into the recycling bin with this method. 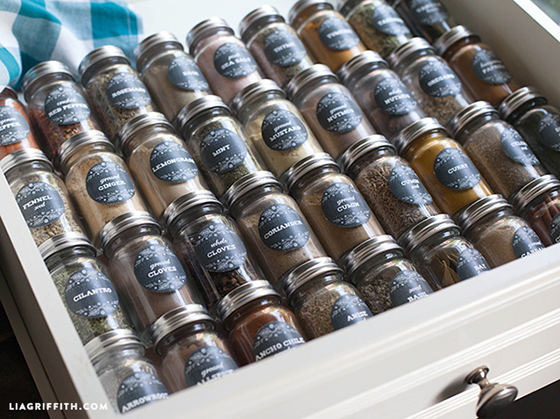 Look how nicely these jars fit into my spice drawer. To make them even easier to keep organized, I trimmed simple triangle baseboard to the width of the drawer, one strip for each row of spices so four strips total. This keeps the jars in place and tips them up slightly so they are easier to grab while I am cooking. I will share more about this in my upcoming kitchen tour. 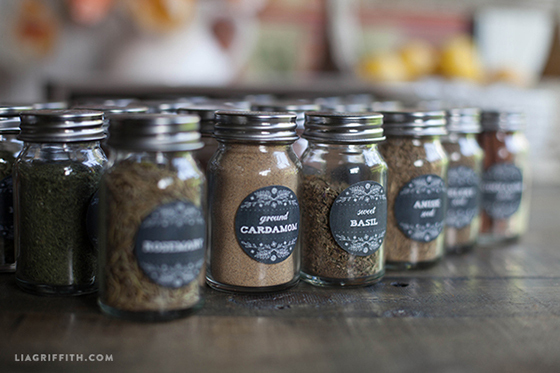 Found this on Pinterest and am currently revamping my spice jars with these labels. Love it (World Market jars are now $1.49-not a bad price still). Question: For the simple triangle baseboard you mentioned, would you be able to tell me where you found that and possibly share an image of what it looks like in your drawer? Thanks so much! Hi Laura! Unfortunately I didn’t get a good shot of my spice drawer before I moved from that house. I’ll update the post if I can find a good example of what it looked like! Does anyone have a SPICE stencil suggestion for the word SPICE??? I could resort to individual alphabet stencils….it’s been a long time since I re-did my wooden spice rack…..I did it decades ago, stenciled on SPICE(god knows how) and decided with my new chalked painted kitchen cabinets and oh this is marble but it isn’t countertop quickfix that I should match the spice rack to the chalked looked…on went the paint and I still like that I tried extra hard forever ago to put SPICE on it as to not confuse myself that it could be used for something else and I just stuck these glass jars for spices that I never got cute labels for, did they even have that then? I think a roommate stuck the name of the spice on a few off the bottle (getting that tape off the glass jar/bottles was so difficult so these free printables are great it I can’t find sticky ones at the store). I am so thrilled that I found these labels! 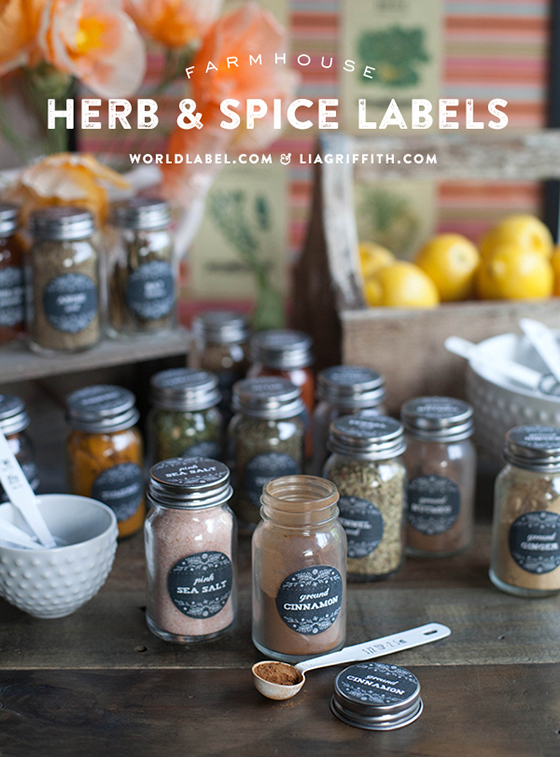 I created labels for the herbs and spices in my cabinet and they are saved to a flash drive along with the font. Had some full sheet Avery sticker project sheets but they are for ink jet and I want good clear quality print so . . .took it to the closest Office Depot and all they had was ink jet in the full size. Saw that you use World Label paper so looked there. I saw two that I thought might work. One is called standard white and one is recycled white ( it is actually the more expensive of the two ). Could you please let me know exactly which paper you used? I would so appreciate it. By the way, I am envious of your creative talent and am so glad that you are willing to share. Hi Marlene! I’m so glad you love these labels, I still love seeing them all lined up in my pantry 🙂 I prefer the standard white from World Label, it’s just a brighter white than the recycled. Thank you for your sweet comment, it means a lot to me and my team! I am concerned about being able to wash these jars with the labels on them. Do they hold up? No, they’re not intended to be waterproof. 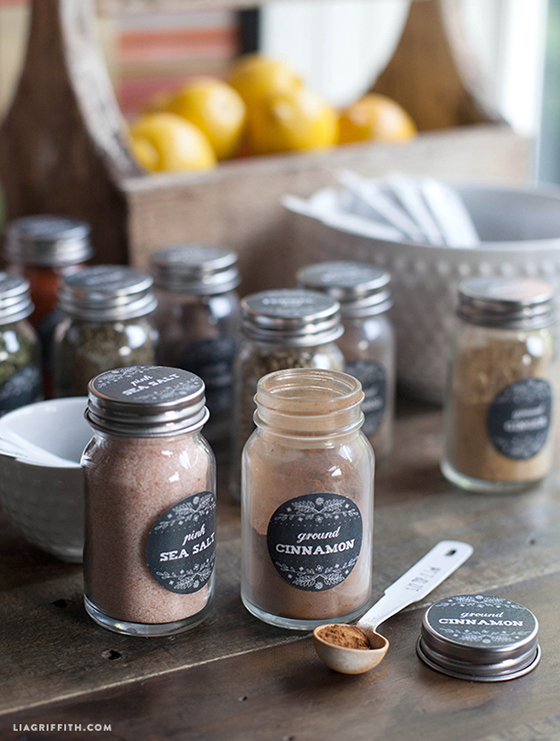 You’ll likely want to print multiple sets of the labels if you plan to wash the jars frequently. Thank you for sharing these super gorgeous labels and making them free of charge!! I’m a fanatic when it comes to super cute stationery and organization supplies! 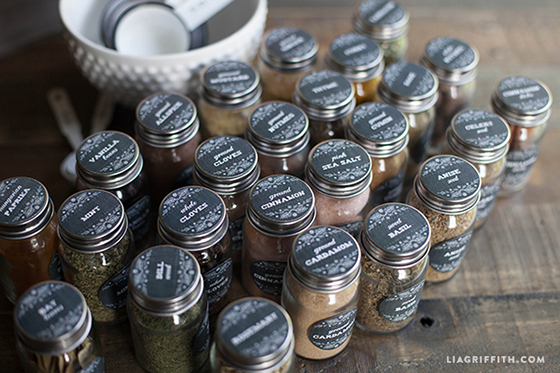 I just printed out the pantry labels yesterday and they came out beautifully, for my mason jar spice bottles. I had to read up on how to do the settings for my printer and what kind of label sheet I had, but it was all worth it in the end. A quick question for you, did you use the matte label sheet or the glossy one? I used the matte and although the font came out nice and bright, the cute flower borders on the design didn’t so much…they came out a bit dull and not at all “chalk-y”, like they’re supposed to. Thank you again! So glad you found these 🙂 I use the matte label sheet. The print quality really just depends on the kind of printer you use. We have a laser at the office but I also run things through my Canon inkjet on the “best” setting for a great result. Just adore all of your creative ideas, thank you for posting these Farmhouse herb and spice labels as well as the matching pantry labels. I have all of mine set and ready to go, saved and placed them on a thumb drive to take to Kinkos. Since I downloaded the fonts like you mentioned, they show up just fine when saved and brought up on my computer. However, when they printed a test set at Kinkos, the more script-looking font showed up but the other didn’t and it just looked like a very plain font, maybe Times Roman or something like that. Do you have any suggestions on ways to translate both fonts to where Kinkos would be able to print them out as they are meant to look? Thank you so much for your time and any suggestions you might have! Hi Holly! So sorry for the trouble. The fonts need to be loaded on the computer printing the job, so Kinkos will need to have them both installed as well. You can save the font files on your thumb drive for them to load! Hi there! Is there a way to download these without having to add my own font? Just download the ones you’ve already added spice names to? Thanks! Hi I have just printed out the labels but they have come out slightly larger than my punch is this normal, and do I just cut them slightly smaller or have I missed something here? Hi Michele! Are you using a 1.5″ punch? Make sure the page is printing at 100% (I know some printers default to “scale to fit”). I’m glad you like the labels! Hello! These are beautiful but it won’t let me download. Am I too late? Follow the links to World Labels. They are hosting this download. I just re did my pantry and these were so so perfect!!! Love how I was able to edit them for my pantry needs! Thanks for such a beautiful design and a gorgeous fun touch to my pantry. Would you mind if I shared your link on my blog? Share!! Thanks for the sweet note and we are excited to see your post. Did you download the font? Unfortunately Acrobat doesn’t allow to designate more than one font so you cannot make it bold. These are the cutest labels I’ve seen on the Internet, and thank you so much for making them customizable with so many options and user-friendly. How do you think it would look printed on clear label paper rather than white label paper? I worry that the labels will start to peel off at the edges with use or get smudged. I thought about cutting clear circles to place over the labels but that’s more work so I figured I can skip a step and print right on clear label paper unless the image won’t look as nice. Thank you so much! Mine still actually look pretty good. I haven’t tried it on a clear label but please let us know if it works:-) It is a great idea! I downloaded your chalkboard template! Im trying to print 1.5″, round spice labels. I bought Avery labels #8293 but they dont match with your template?? 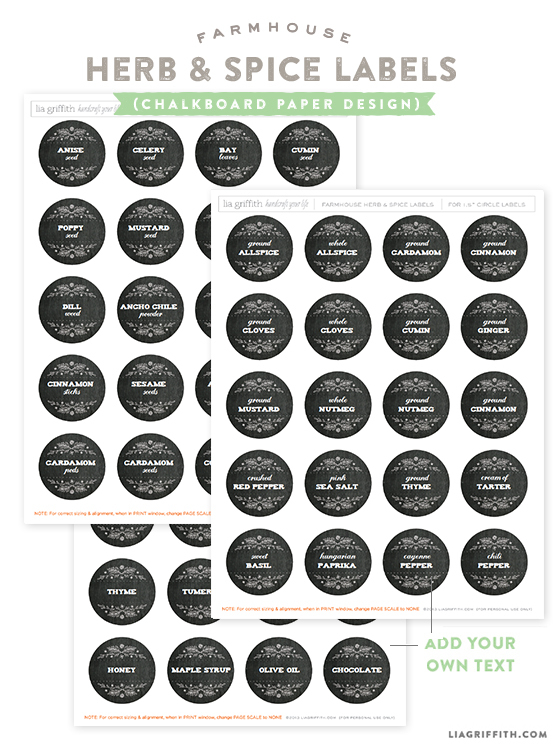 I usually print on solid label paper and then use a punch to cut out the 1.5″ round shape. I always find it to be more trouble to try to line up the pattern with the Avery template since you have to use their word template. This template wasn’t designed specifically for Avery. Love love love these labels and was wondering if I could use label, too. I never had luck lining them up but once someone was able to help me with it (I’m not sure how but it wasn’t in Word). What brand cutter do you like? I bought a Fiskars but didn’t find them particularly sharp. I can’t wait to put them on my spice jars finally! I never have any luck either getting them to line up;-) I use either Fiskars or Marvy brand punches. I downloaded the Farmhouse labels which are great (thank you) but I would love to see one of the labels that is blank so you can write in your own spice. What do you think? 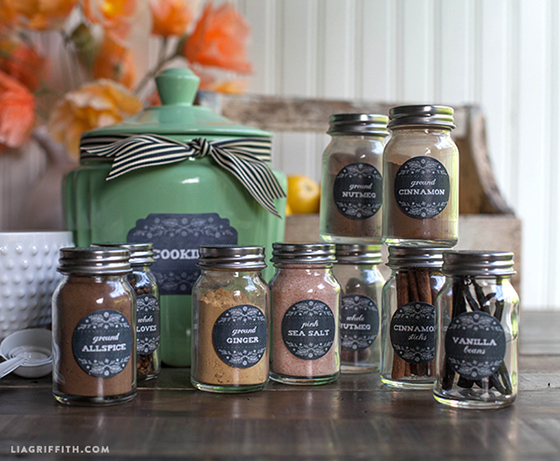 Love the labels and planning to re-do some of my pantry! I tried the blank labels link and got a page not found-so wondering how to do custom labels. Also, is there a blank label for your pantry labels as well? Thank you! Hi Lia! I just adore your work!! Yesterday I printed these labels in a supply office, but the chalkboard doesn´t look like the one in your photos, it is much more thin. Also, I wasn´t able to edit the labels with Adobe Reader (the only way was editing them in the browser and the downloading them in my computer). Thanks so much for such lovely stuff!! I am planning to redecorate my hole house. Hi Maria and Hi to Argentina! The quality of the chalkboard depends on the printer. Usually you will get better quality with a laser printer. I would try printing them at an office supply store like Kinkos or Office Depot. They have nice laser printers, must home printers are ink jet and they quality of the laser prints are generally much better for images. What type of world labels did you use? I’m torn between the glossy version and the reusable version. Thoughts? I use the matte version. Oh, this is adorable! You make such cute stuff Lia 🙂 thanks for sharing!. I couldn’t quite figure out if you use sticker paper? if not, how/what do you glue it with? I use label paper from World Label.com, Avery has similar type of label paper. Mine downloaded. I have the square spice tins in my kitchen Island drawers and I found out if you print these out in landscape mode they are the perfect size for them. Was just trying things out and it worked. They are hosted on World Label’s blog. The links will take you there and you can use the same buttons on his site to download. I have 40 spice jar lids to cover. 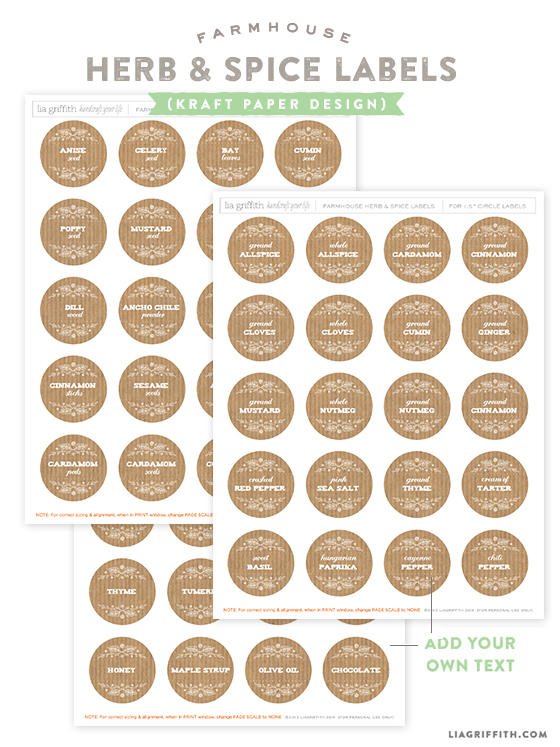 To save work, will these work on 1 1/2″ Avery round labels (#8293) instead of cutting each label with a round circle punch? I had download it and was able to edit the first two pages, just not the last page with the single line of type. I didn’t know if maybe one browser downloaded things more “thoroughly” than another. I cannot begin to tell you how much I adore these new jars and labels in my pantry- I am well on my way to have a full blown chalkboard label addiction! Thanks so much for making them available! Love these- they look amazing. I bought the jars last weekend and was getting ready to print but wasn’t able to edit the third page. Any idea why? Using Firefox browser. You will need to download the file and open it in Adobe Acrobat or the free version which is Reader. You can’t edit there in the browser window unless they are changing that function. . . which would be great! how can you add your own text? I looked for the details on the triangle baseboard you made to hold the jars in your kitchen post and didn’t see them, do you mind sending me the link? I made the jars and just need to organize them in the drawer. You are so talented I love to get posts from your blog and share your creations with others. These look great, and really professional! Did you make them yourself? I love them! I’m redoing my pantry and this will definitely help to make it look absolutely gorgeous! I’d pay for this – without a doubt! Ooooh I love, love, LOVE these! If you don’t mind my asking, where did you get the jars? If I’m going to redo all my labels, I’d like to start with all the same jars. lol thank you. I’m not even going to try to figure out HOW I missed that! Labels printed and off to my local World Market. Thanks again! Yay!! I love them. Bought them over a year ago and would do it again! I LOVE these! Thank you so much for the gorgeous printables…. and the link to the jars. Looks so much nicer than the jars they come in! I hate to sound stupid, but could you please post a picture of the baseboard you used to hold the jars in place? It would really help me to see it. Thank you in advance if you are able to post the pic! I actually scrubbed all of the old version off for this new version. Both are nice, I like the added sweetness to this set with the flowers.